Donald Trump’s administration announced on Monday it would be imposing a 30 percent tariff on foreign-made solar panels, sparking warnings that the new regulations are a blow to alternative energy adoption across the U.S.
A 30 percent tariff would be applied to imported solar modules and cells in the first year. In the subsequent three years, that number would decrease to 25 percent, then 20 percent and then 15 percent. Currently, more than 95 percent of America’s solar panels are imported, with half of those imports coming from Malaysia and South Korea. While that global production frenzy has hurt American solar manufacturers, it has been a boon to those who want to buy solar power. The average cost of solar installations in the United States has fallen 70 percent since 2010, from $7.50 per watt down to around $1 per watt. As Bloomberg reported in September, developers have been buying up as many panels as possible in advance since May, “after bankrupt panel manufacturer Suniva Inc. filed a trade complaint asking for protection from cheap imports.” The U.S. International Trade Commission later ruled in that company’s favor, setting up the conditions for Trump to impose the tariffs now. 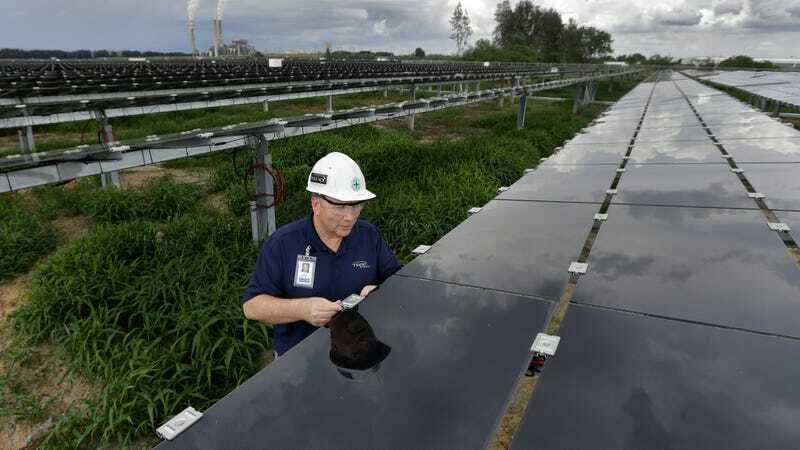 According to CNBC, the Solar Energy Industries Association said in a statement that the solar tariffs could cost 23,000 jobs in 2018 and delay or terminate “billions of dollars in solar investments.” Just 14 percent of U.S. jobs in solar are in manufacturing, per Reuters, and the installation services which employ many of the remainder are sweating in anticipation of a major reduction in orders.